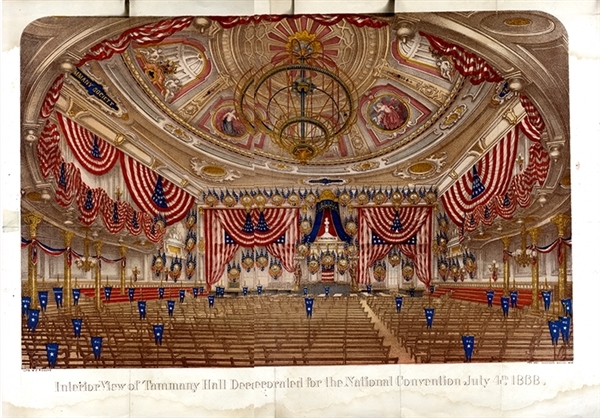 1868 Print of "Interior View of Tammany Hall Decorated for the National Convention July 4, 1868", measuring 13 3/4" x 19 1/2". Printed in blue, red, brown, and gold. Lithographed by W.C. Rogers for Jos. Shannon's Manual in 1868. The ornate Tammany Hall in New York is decorated with red, white and blue bunting, with banners for each of the state delegations on the floor. You can sense the excitement in the air as this important Presidential nominating convention neared! A rare and desirable poster. Has some age, but would look wonderful matted and framed. We sold another example, realizing $380.00, in our August 2004 auction (lot #1469). Would make a great presentation when matted and framed.